Click here to see more photos at Flickr. Click here to see more photos at Facebook. Click here for Timelapse Videos at Vimeo. Starting tonight, go out and look west after sunset everyday. 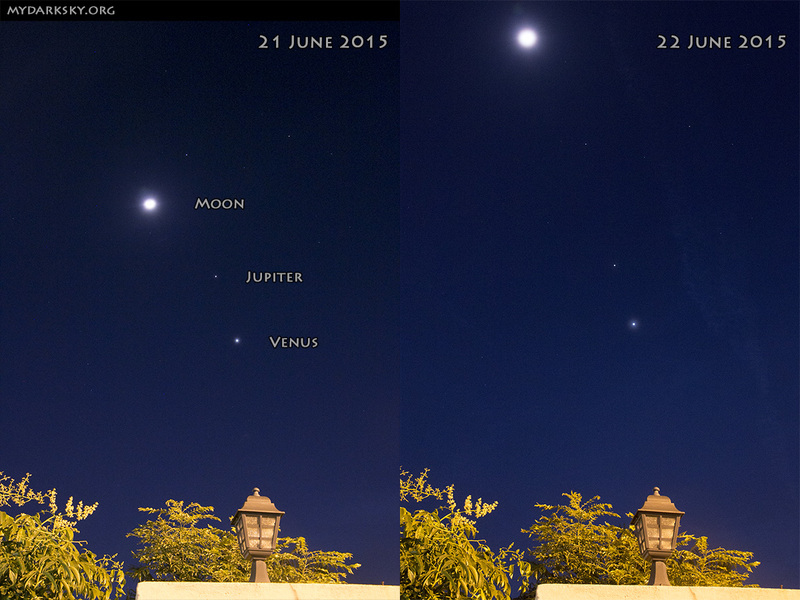 You will see two bright “stars”; but they are no stars, the brightest one is planet Venus and the other is Jupiter. If weather permits, you may also see a third bright star, and that is a real star named Regulus, the brightest star in Leo the lion. These two planets are currently “moving” toward each other and will meet at the end of this month, where you can see them side by side. They are so near to each other that their separation is even smaller than our Moon’s diameter! The picture below was taken on 21 and 22 June. The Moon has “moved up” due to its orbit around the Earth. Look at Venus and Jupiter, it may not be obvious at first, but if you measure their separation carefully, you will find that on they were nearer to each other on the 22nd compared to 21st. And they will be nearer and nearer for the nights to come! Update 2: WE ARE ON THE COMET!! Update 1: Rosetta view of Philae shortly after separation. Today is the day! After more than 10 long years in space. In March 2004, we sent the Rosetta spacecraft to the comet 67P/Churyumov-Gerasimenko. 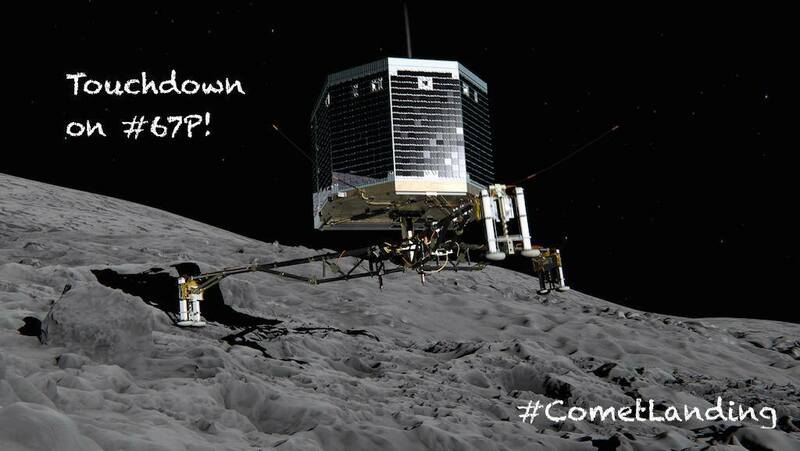 Rosetta is carrying a lander called Philae, and today, Philae was released to land on the comet surface! In the meantime, let’s watch some videos on Rosetta and Philae. This looks like a scene from a movie, but it’s not. It is a real picture taken by a spacecraft currently visiting a comet called Churyumov-Gerasimenko. The double-lobed thing on top is the comet and below it is the 14-m long solar array of the spacecraft called Rosetta. 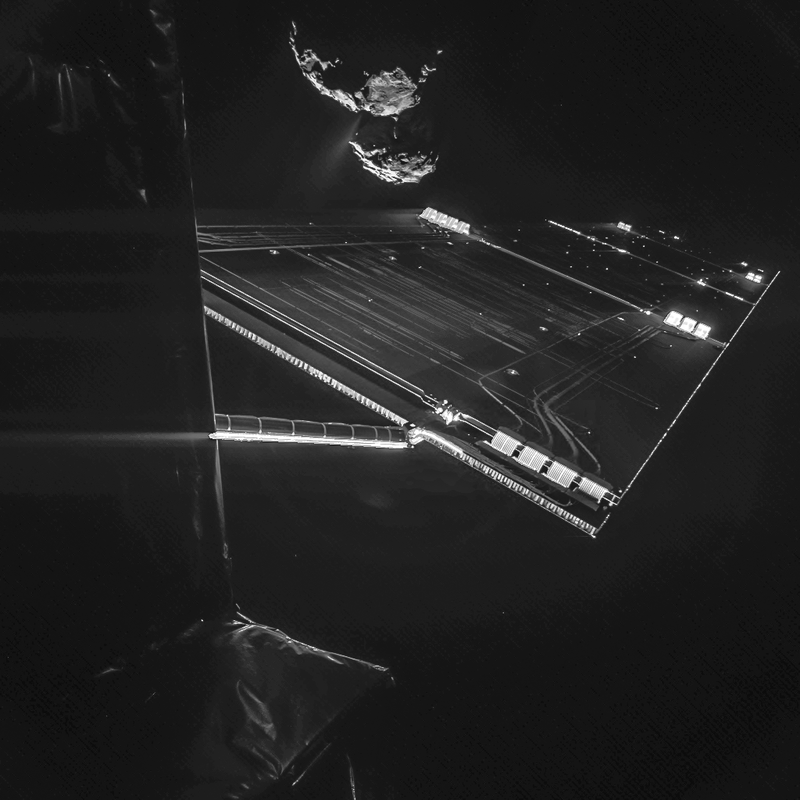 This picture is taken by a lander called Philae that is attached to the spacecraft. And can you imagine that this lander is going to separate from Rosetta on Nov 12 and land on the comet?! When people start asking why spend money in space, just show them this picture and tell them, because picture like this can inspire people, showing that passion, perseverance and dedication can make us reach for the seemingly impossible task. If we can think of it, we can do it! p/s: by the way, spending all the money down on Earth also doesn’t guarantee that it can solve Earth’s problems, and the fact is, the money spends in space is only a very small portion compared to the money spend in war! Yay! 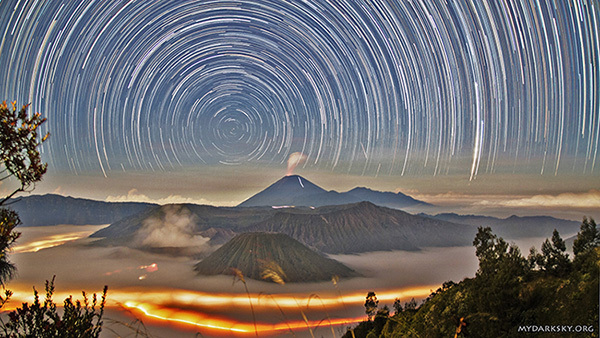 My picture of star trails above Mount Bromo was featured in today Astronomy Picture of the Day! This picture was taken in June 2014 on a lookout point named King Kong Hill, overlooking the volcanoes in the Bromo Tengger Semeru National Park. The nearest mountain in the centre is Mount Batok, the steaming crater on the left is Mount Bromo, and on the far is the erupting Mount Semeru. Mount Bromo sits inside the Tengger caldera of fine volcanic sand, with a diameter of approximately 10 km . The bright streaks of light at the caldera below a layer of fog were jeeps carrying tourists to lookout points to view sunrise. This star trails above the volcanoes were a combination of 270 images with a total exposure time of 2 hours and 15 minutes. All the stars rotate around the south celestial pole except of one that “did not behave” (a meteor near the centre right of the picture). The rising Moon brightened the landscape and made the sky bluish. On 11:59 pm, May 3, 2013, I boarded a plane to Perth, Australia. This was the beginning of my 17 days trip to Western Australia. Purpose: to witness the May 10 annular solar eclipse. We travelled in an Apollo motorhome to the Pinnacles, Mullewa, Cue, Kumarina (eclipse observation), Tom Price, Narutarra, Exmouth, Coral Bay, Blowholes, Hamelin Pool, Port Gregory, Pinnacles (again) and finally back to Perth on May 20. The timelapse below documented the Sun, Moon, planets, stars and clouds of the whole trip including the annular solar eclipse. Click this link to see still images. 00:01: Pinnacles, Nambung National Park, near Cervantes. 00:05: Sunrise, a day before the 10 May 2013 annular solar eclipse. 00:13: Sunset at Carnarvon Blowholes. Jets of water can be seen erupted into the air to the right of the Sun. Powerful ocean swells force water through sea caves and up out of narrow holes in the rocks, creating this spectacular sight. 00:22: The ground is moving instead of the stars is due to the tracking system. It tracked the stars, thus the stars stayed at the same place while the ground moved. 01:10: Tom Price Tourist Park. 01:28: Sunrise annular solar eclipse of 10 May 2013 at Kumarina. 01:53: Look carefully to see the green flash. 02:07: Vlamingh Head Lighthouse, Exmouth. 02:11: Coral Bay. The reflections of Jupiter and stars (especially Orion) can be seen on the sea. 02:24: Carnarvon Blowholes. The landscape was light up by the moonlight. As the moon set, the surrounding became dark. 02:43: A very bright meteor streaked behind the trees on the far bottom right. 02:51: The bright area on the right (with visible tall towers) is Harold Holt US Navy Communications Base. 02:55: Turn 180 degree from the view in 02:51 is the Vlamingh Head Lighthouse, Exmouth. 03:03: Tom Price Tourist Park. 03:37: Pinnacles, Nambung National Park, near Cervantes. The Pinnacles are light up by the Moon. 03:43: Pinnacles, Nambung National Park, near Cervantes. The shadows on the ground were moving as the Moon moved across the sky. 03:47: Hamelin Pool at Shark Bay. 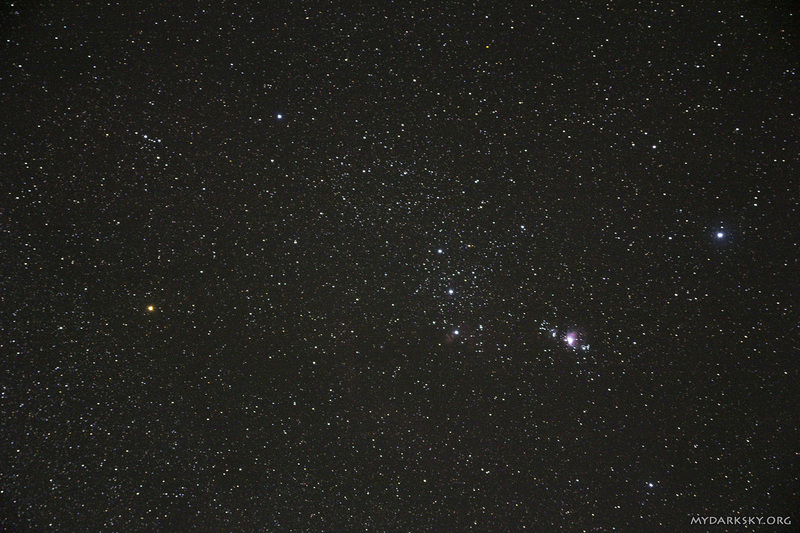 Notice how near to the horizon Big Dipper is (slight right of centre). The Moon light up the boardwalk and the stromatolites in the sea. The Hamelin Pool stromatolites are oldest and largest living fossils on Earth. Stromatolites are considered ‘living fossils’, part of the Earth’s evolutionary history. This is my first trip to Australia and I’ve fall in love with the Australian sky… I’ll be back! Almost one month ago, everyone was in comet hunting mood. Me too. In Malaysia, this Comet PanSTARRS was not more than 15 degrees above the horizon. To us, it was a challenge, because we seldom have a clear cloudless horizon. But unwilling to give up easily, I spent every evening for one whole week at different locations staring at the western horizon, hoping to get a glimpse of the comet. But not all is lost, while waiting for the comet to appear, the cameras were happily snapping away and below is the result. Enjoy. Last November (2012), I went to Nan, Northern Thailand to attend a family function. 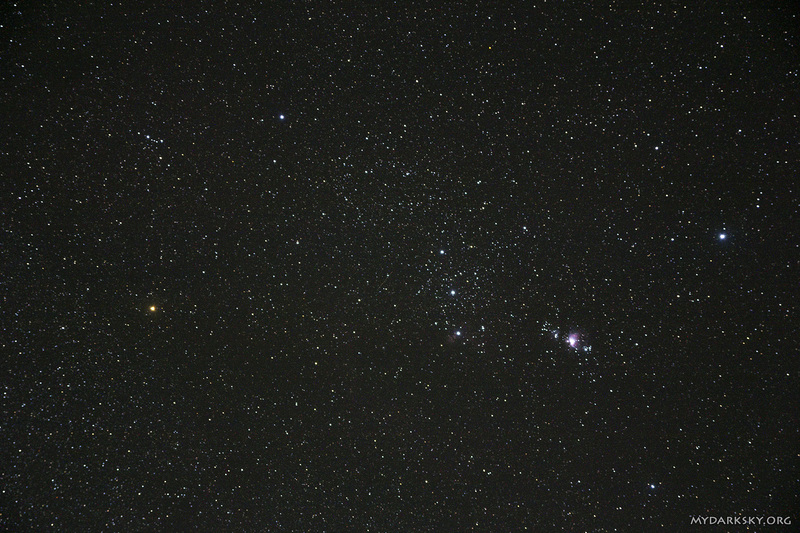 Nan is a small town with minimal light pollution, and is a fantastic place for stargazing. I spent two nights on the rooftop balcony catching the star lights. I bought along with me two cameras, Canon EOS350D and 60D, Vixen Polarie Star Tracker plus a tripod and two ball heads. Since I need to travel around, I had to minimise my stuffs. 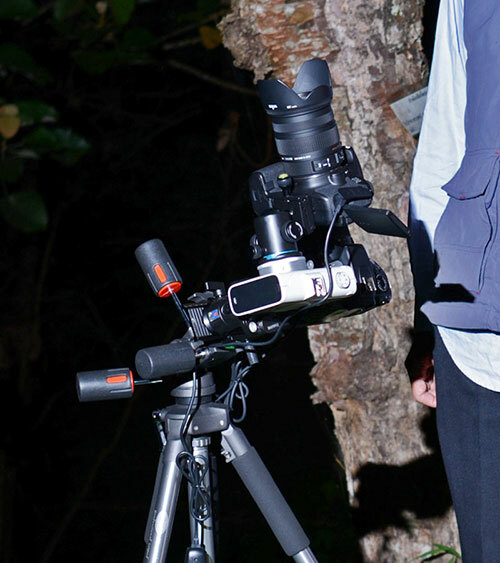 This setup provided me with all I need to capture the stars, and at the same time, did not weigh me down, especially when I can replaced my bulky equatorial mount with a camera-body-sized Polarie star tracker. During my two nights in Nan, and later one night in the nearby Doiphukha National Park, I dedicated one camera for shooting timelapse, and the other for still images. I used Polarie for two purposes: as tracking system, and for panning effect in timelapse. The setup of Polarie was simple and fast. It took me less than 10 minutes to hook up everything onto the tripod. 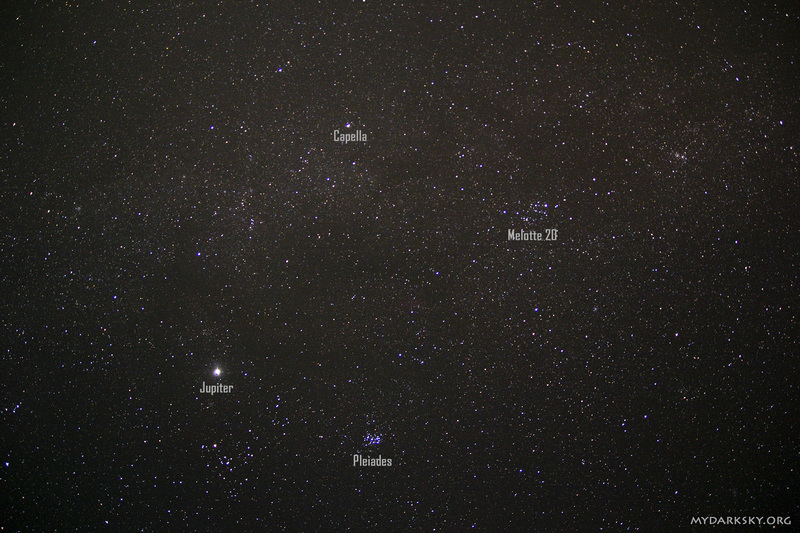 As I was in Northern Thailand (~19 deg N), Polaris was easily visible. I pointed the small hole (on the top right corner) to the star Polaris for polar alignment. When I looked through the hole, the field of view is relatively large compared to the star. Sometimes I was not quite sure if Polaris is exactly at the centre or not. 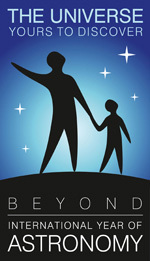 For those who are not familiar using a telescope’s finderscope to search for stars may have difficulty trying to determine whether the star they are seeing through the hole is Polaris or not. But to me it was OK since I’m a seasoned telescope user. First, I shot a wide-field view (FL17 mm) of Jupiter together with Taurus, Auriga and Perseus with exposure times of 1 min and 4 min. The tracking was good with slight but not obvious trailing of stars. 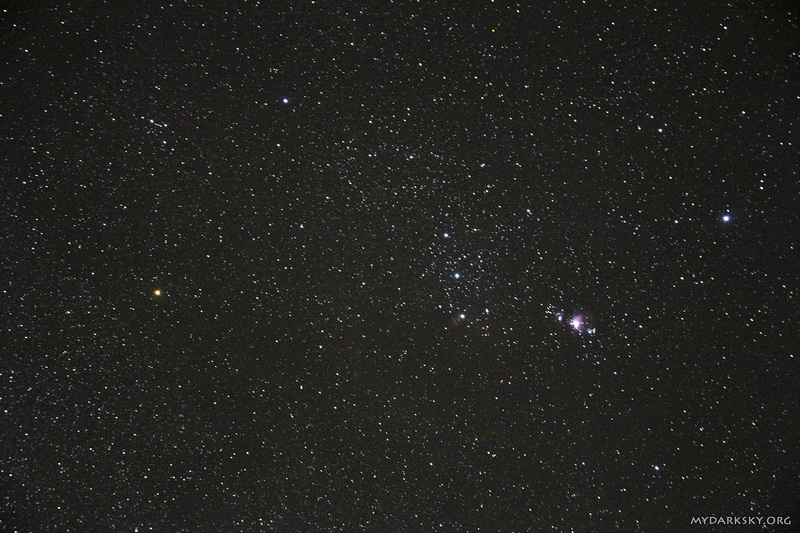 Next, I framed Orion with a higher zoom (FL50 mm). For a 3-minute exposure shot, the tracking was good with the stars showing some nice round dots. Signs of trailing started to show up in a 4-minute shot and became evident when exposure time is longer than 4 minutes. The reason may be due to the polar alignment inaccuracy as mentioned above, which will become noticeable as the focal length or exposure time getting longer. To solve this problem, Vixen has two optional accessories: the Quick Polaris Locator Compass and Polarie Polar Axis Scope. The Compass can also be beneficial when Polaris cannot be seen, for example if a tall building or trees is blocking the view of the north. Polarie was also used as a panning device for my timelapse movie, and I just love the results. There are two scenes in the video below that showing the panning results by using Polarie. The first one is from 0:39 to 0:47, I was halfway through the scene when the clouds rolled in and forced me to terminate the sequence. The second one is from 1:52 to 2:31, taken in the National Park where the surrounding was full of trees. The stars were only visible on a small patch of sky above and between the some trees. Then I got this idea of moving my camera along the gap between the trees to capture the stars, and the result was, well, you can see for yourself in the video. The Setup: one camera was mounted on Polarie and the other camera was mounted directly on the tripod. This setup was for shooting timelapse. Lastly, I would like to talk about the battery consumption. Polarie uses either two AA batteries or an external power supply (such as a power bank through a mini USB port) as its power source. In my case, I used rechargeable AA batteries, and averagely it can last for 2 hours. I would like to note that I’m using old rechargeable batteries where their performance had already deteriorated. For new fresh batteries, it should be able last longer. Overall, I’m very happy to have Polarie when I was out shooting. Its compactness makes my travel lighter and its ease of use makes my shooting session more efficient. I’m looking forward for my next night to use it again.